In one of my prior blog posts I told you about why I love WordPress verses Blogger. It literally took me over a year to make the change from Blogger to WordPress. I was literally scared of using WordPress. Now, I am helping others with using it. However, that doesn’t mean I know everything there is to know about how to best make some changes on my theme and layout. I have studied a lot about blogging design in the past year. I told you in my last post about the #LearntoBlog Online Class that I was also given a critique of my website as a part of our class. I immediately sought out help to make the necessary blogging design changes to my website that I couldn’t do on my own because I didn’t want to take the time to learn how to do them this time. I wanted immediate change and results. Kristie Hill from Blog Ambitions helped me make my changes. I choose her to help because she provides amazing simple tutorials to help you make your blog look professional when you’re using WordPress. I love her goal for Blog Ambitions! It’s been a wide spread topic among bloggers that WordPress is the platform you want to use if you want your blog to grow and be considered a “professional” blogger. It is always up for debate, and I have seen some successful bloggers who use Blogger. HOWEVER, there are many things to consider when you compare the two platforms. Kelli and Crystal cover that topic really well in their Differences in Blogger and WordPress #LearntoBlog video. Kristie from Blog Ambitions is willing to help you with your blog migration to WordPress, Custom Fonts, Custom Colors, and additional widget areas. As a Tidbits of Experience reader, you can get $10.00 off of her services (which could result in a FREE migration to WordPress!) 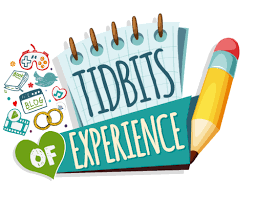 Just visit http://blogambitions.com/services/ and use the coupon code Tidbits$10off to take advantage of this offer. Kristie Hill is very easy to work with. She gives you the option to approve any changes that are made to your blog before she makes them go live. She quickly responds to emails, and before she leaves you she makes certain you have everything you want on your blog. Plus she leaves you with some suggestions that you can easily change on your own blog using her easy to follow tutorials. She even shared with me some of her favorite blog posts. She’s another great resource to go to for learning about blogging tips. I highly recommend her services for making your blog look amazing. She’s reasonably priced and works diligently to have your changes done in a timely manner. Do you have any major blogging design changes that you would benefit from using her services? Focus on our blog and let someone else take care of the things under the hood is something I am starting to realize and believe in a big way so I loved this post. I am going to share this post of yours with her links with my Tribe. I especially like the Passion Fruit idea and need to read a few more of the links above. I’m glad you enjoyed this post. I actually really enjoyed sharing it. I can’t begin to express how nice it was to not spend all that extra time trying to learn a new skill! I learned at Niche Parent Conference that my sidebar should be about my site not things that take readers off my site so I am slowly working to remedy that. I’ve been with WordPress from the start and I’m so thankful- always felt it was pretty user friendly. For me, blogging is an outlet. I’m a writer and so I’m thankful to have the platform to express myself through words. I love to read what you write. I wish I had started on WordPress. I started with Blogger and still have a couple, I moved to WP about 5 years ago and love it for my main blog, but I do find there are things I could on Blogger that I cant on WP. On blogger sidebar management and on WP I can utilize SEO better on WP, there are so many plugins and options. Great for getting noticed. Either one is a lot of work. I am a Lifestyle blogger and write about many things, including blogging tools and helps. I have to say that both do have awesome features. However, for a pro blog, I still feel that moving to WordPress is a better choice for sure. WordPress is key when working for search engine traffic! I’ll have to read some of Kristi’s posts. There is so much design stuff I need to do, but so little time. Just finished a cousin’s birthday party weekend, so maybe I’ll now have some time . . . Thanks for the info. I have saved the information.